The Quality Assurance Project offers CD-ROMs designed to strengthen health worker performance and affect health outcomes. The Tuberculosis (TB) Case Management CD-ROM is used to train health workers in TB diagnosis and treatment, using the World Health Organization's Directly Observed Therapy Short-Course (DOTS) approach. Users can practice and apply mastery of DOTS on simulated cases and improve treatment and diagnostic decisions using computer-generated feedback on their performance. This CD-ROM was tested in Ethiopia with 100 doctors, nurses, and other health professionals, and results indicate that health workers can learn faster from the program than traditional paper-based training and raise their competence scores for correct TB case management. Place an order. 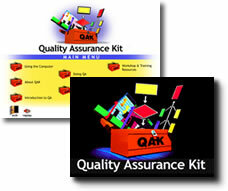 The Quality Assurance Kit provides interactive and text-based information on quality assurance principles, methods, and tools. An alternative to print-based learning, this CD-ROM was designed to build capacity in QA skills and to support QA teams seeking to use the QA methods and activities in a problem-solving program. The QA Kit's computerized tools include a budget tool, client classification matrix tool, flowchart, prioritization matrix and Gantt chart, to name a few. This CD-ROM was beta tested in Ethiopia, where health professionals found it to be very stimulating and potentially useful in their work. Test results were used to improve content for this version (2001). Place an order. Managing Quality Through Regulation: Priorities and Possibilities is a CD-ROM presenting materials from a conference by the same title that took place in Washington, DC, in October 2000. The CD-ROM includes the conference agenda and materials, Powerpoint and text summaries of technical presentations, biographies and photographs of speakers, and resource materials of relevant technical publications in English and Spanish from QAP and the Pan American Health Organization (2001). Place an order. The Quality Assurance Project (QAP) is funded by the U.S. Agency for International Development (USAID) under Contract Number GPH-C-00-02-00004-00.